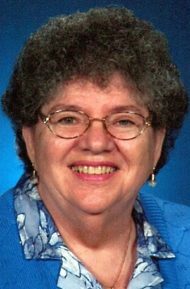 Peggy R. Koelsch, 82, passed away at Brethren Village Retirement Community on Monday, March 25, 2019. She was born in Lancaster to the late E. Ruth Bair Houck, and grew up in New Holland. Peggy’s husband of 60 years, George W. Koelsch, Jr., passed on December 20, 2016. A graduate of New Holland High School, Class of 1954, Peggy attended St. Joseph Hospital School of Nursing. She was the office manager and owner, with husband George, of Shoes ‘N Things in Lititz, and later worked as office manager for Jack Wolf Tree Service for 10 years. Peggy and George were charter members of Highland Presbyterian Church, where she was very involved. She loved her Highland family and was active in Highland Clan Camping Club for decades. Peggy and George slept in all 50 states and RV’d to all continental states and all provinces of Canada. Surviving Peggy are her three children, Dr. Patricia R. Stoudt, wife of Paul Stoudt of Bloomsburg; Charles D. Koelsch, husband of Dr. Jamie Koelsch of Lee’s Summit, MO; and James B. Koelsch, husband of Lisa Koelsch of Lititz; her daughter-in-law Deb Mohr Koelsch of Mount Joy; and her 9 grandchildren and 7 great-grandchildren. In addition to her mother and husband, Peggy was preceded in death by her son G. Richard Koelsch in 2017 and her brother James W. Houck. A Celebration of Peggy’s life will take place 11 AM Thursday, March 28th, at Highland Presbyterian Church, 500 E. Roseville Rd., Lancaster, PA 17601, with The Rev. Dr. Roger R. Rabey officiating. Peggy’s family will receive friends from 10 to 11 AM at the church, with private interment in Highland Presbyterian Memorial Garden. In lieu of flowers, kindly consider making a memorial contribution to the Good Samaritan Fund at Brethren Village, 3001 Lititz Pike, Lititz, PA 17543. I am so sorry about the loss of your mother. How well I remember your entire family. It was a pleasure to know your mother and father and shop at your mom’s store. I actually bought a table from her when she closed her shop. It was also a pleasure to teach you four Koelsch children (I believe I did, and I am seeing all of you in my mind’s eye!). Until reading the obituary, I didn’t know that your father and Rick had passed away. I am sending heartfelt condolences to all of you and hoping that sweet memories of family times will help to abate the grief you are now experiencing. She was a very special lady. Our families did so many things together, will always remember what great friends she and George were. So very missed Howard L McIntyre Jr.
My deepest condolences to the families of momma Peggy, her joy and humor will be greatly missed. Praise the Lord that she is in glory with her Savior Jesus. Extending my condolences to the families of Peggy. “Momma” is in Our Heavenly Father’s presence now rejoicing with her husband and son.